Thank you for your interest in Sphygmomanometers. Please complete and submit the form below and an ADInstruments representative will aim to get in touch within one working day. If you’d like to speak to someone immediately, office contact information is available from the contact page. Supplied with both an adult and child-sized cuff. The pressure transducer is suitable for connection to a Bridge Pod. Supplied with both an adult and child-sized cuff. The pressure transducer is suitable for direct connection to a PowerLab and can also be connected to any Bridge Amp. Supplied with two arm cuffs (adult and child) and one thigh cuff (adult). The pressure transducer is suitable for direct connection to a PowerLab and can also be connected to any Bridge Amp. Demonstrate clinical blood pressure measurements in a lecture, tutorial or practical class with these sphygmomanometers, each of which is coupled to a pressure transducer. 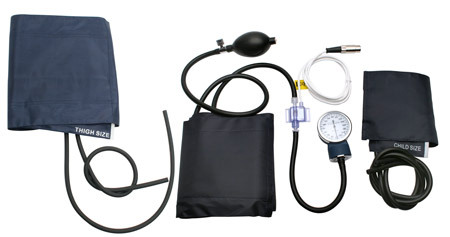 Each sphygmomanometer unit is coupled to a pressure transducer that converts the applied pressure into an electronic signal, which can be displayed using a PowerLab in LabChart. These units can be used in teaching, for example to demonstrate clinical blood pressure measurements in a lecture, tutorial or practical class. They are not intended for clinical use. The pressure transducer is available either with a connector for a Bridge Pod or with an 8-pin DIN connector, which is for direct connection to a PowerLab Pod port or to a Bridge Amp. Sphygmomanometers are supplied with your choice of cuff(s). 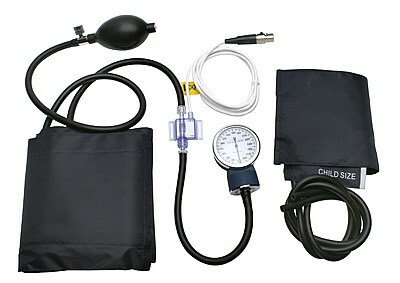 The Sphygmomanometer with 3 Cuffs (DIN) is supplied in the Human Physyiology Kit. The Cardio Microphone allows simultaneous recording of arterial pulse sounds during a blood pressure measurement.